Cheesy Chicken Enchiladas are the perfect dish to put on the table for brunch or dinner. And, you can work them into your menu plan after your weight loss surgery. Kids love tacos, so why not introduce them to enchiladas? 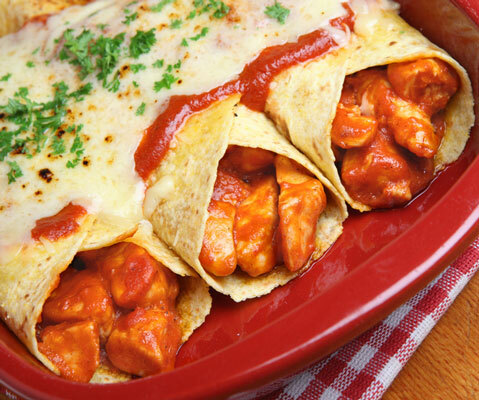 After making the chicken mixture, have your kids fill and roll the enchiladas. When baked to perfection, let them cool slightly and serve with Black Bean Salsa. Preheat the oven to 350 degrees F. Using nonstick cooking spray, grease a 9-x-13 baking dish. In a small bowl, combine chicken, lowfat cheddar cheese, and 1/2 cup pepper jack cheese; toss until mixed well. Place 1⁄3 cup of cheese and chicken mixture into the center of one whole-wheat tortilla, tightly roll, and place seam down into the baking dish. Repeat with the remaining five tortillas. Place 1/4 cup of enchilada sauce over each stuffed enchilada and top with the remaining pepper jack cheese. Bake for 12 minutes, or until cheese is melted and bubbly. In a small pot, heat oil over medium-high heat. When the oil is hot, add the flour and chili powder. Reduce heat to medium and cook until light brown, stirring constantly to prevent the flour from burning. Add the tomato sauce, water, cumin, garlic powder, and onion powder to the pot and stir until smooth. Continue cooking for 10 minutes, or until thickened slightly. Per serving:Calories 370 (From Fat 135); Fat 15g (Saturated 7g); Cholesterol 60mg; Sodium 540mg; Carbohydrate 31g (Dietary Fiber 4g); Protein 25g; Sugar 4g. Place all ingredients except black beans into a food processor and pulse for 15 seconds. Using a rubber spatula, wipe down the sides of the bowl and pulse for 15 more seconds. Stir in black beans. Serve 1/2 cup black bean salsa with each steak. Per serving: Calories 340 (From Fat 170); Fat 19g (Saturated 7g); Cholesterol 75mg; Sodium 490mg; Carbohydrate 17g (Dietary Fiber 4g); Protein 29g; Sugar 4g.